Photographs by Yany Chan (15S06E) and Sharmaine Toh (15S07C) Raffles Institution’s Chinese Language Drama and Cultural Society (CLDCS)’ annual production, 翠谷回响: 雾中人 (meaning ‘Man in the Mist’) was held on 15 May this year to a resounding turnout. 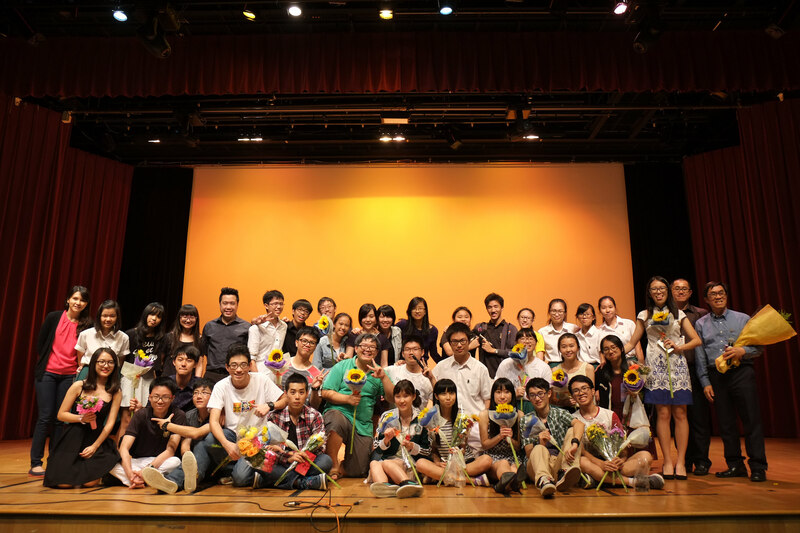 The production showcased 3 member groups of their CCA: drama, songwriting, and calligraphy; drama and songwriting members performed their works during the concert, and calligraphy members displayed their works outside the PAC. 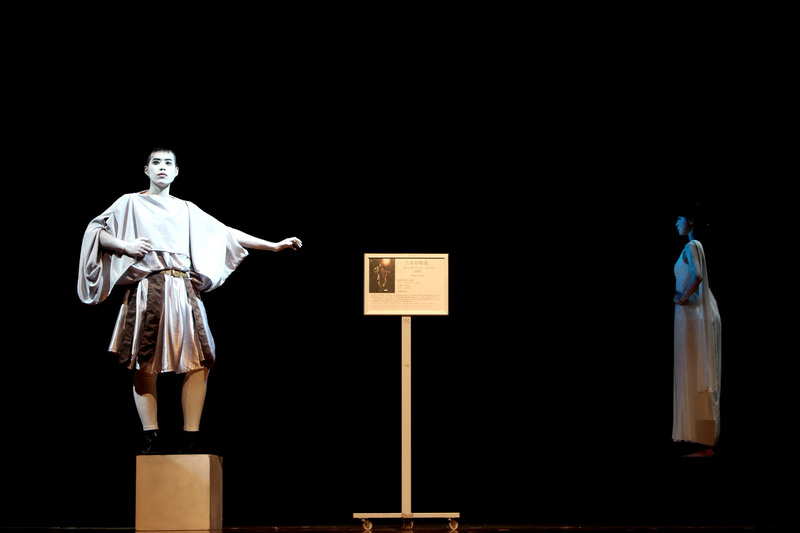 The production opened with a play, 雕像 (Sculpture), which was told from the perspective of an unnamed Greek statue in a museum. One day, to the statue’s utter confusion, he found himself alive and possessing the qualities of a normal human being. Desperate, alone, and with no one to seek help from, he wandered the streets countless times to seek answers to his existential distress, including the reasons why he came alive, how he should live, and who exactly he was. Two of the three statues in the museum. The play evidently struck a chord with audience members, who gave a resounding round of applause for all the actors once it had concluded. While the action initially moved rather slowly, and relied heavily on short scenes to drive it, it gradually built up towards the centre of the play, when the plot twist was revealed: the other two statues in the museum were, too, alive. There were several scenes which required the three statues to stand still on wooden display blocks, and one can only imagine how difficult it must have been for the actors. This sentiment was echoed by Chairperson Jia Zhuo Jian (15S06H), who played one of the statues. He shared that standing still for such a prolonged period had been a “challenge”, as it was “not easy to maintain one posture for long”. Next up was the song segment, which saw Zhu Deng (16S07D) as the opening act. 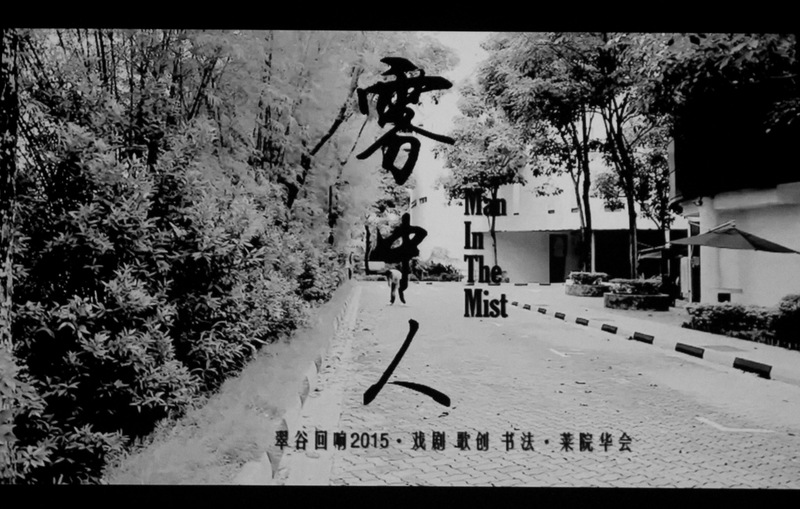 His original song, titled 感动不是爱情 (Feeling Touched Is Not Love), was poignantly delivered to convey the message that feeling touched by someone’s actions is not equivalent to loving them. One just needed to listen to the music to feel the emotions he compellingly brought out through the soulful music and impressive vocals. Later, he shared that he “took some of his personal experience to recreate a scenario that fits the song” — which was done to great success. Six more original songs were performed throughout the concert, but several were unfortunately marred by out-of-tune vocals. Yet the hard work and effort put in by all the CLDCS song-writing members was clear, especially since some of them did not have prior music background — Zhu Deng commented that his “limited” music background made his song-writing journey “fun, but quite challenging”. 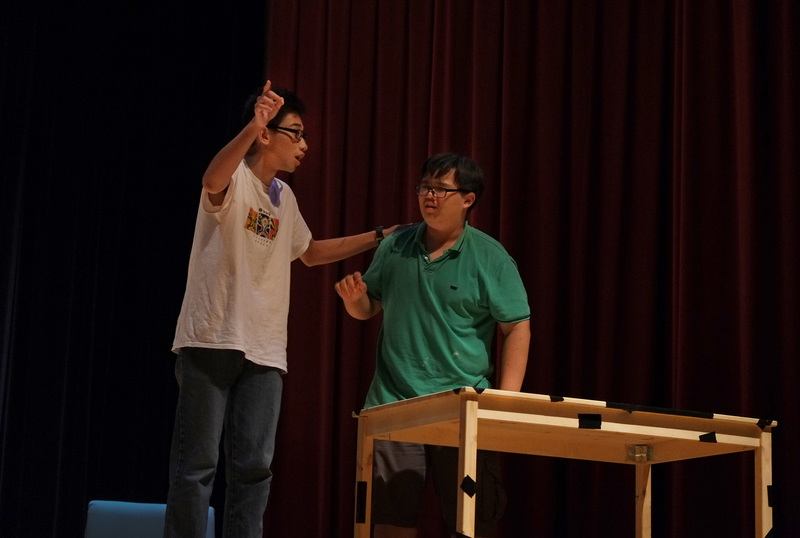 A 15-minute intermission was followed by a unique performance, 五句话 (Five Sentences), which required the five actors to come up with a short play within 30 minutes, based on 5 audience-contributed sentences which had been collected before the intermission. 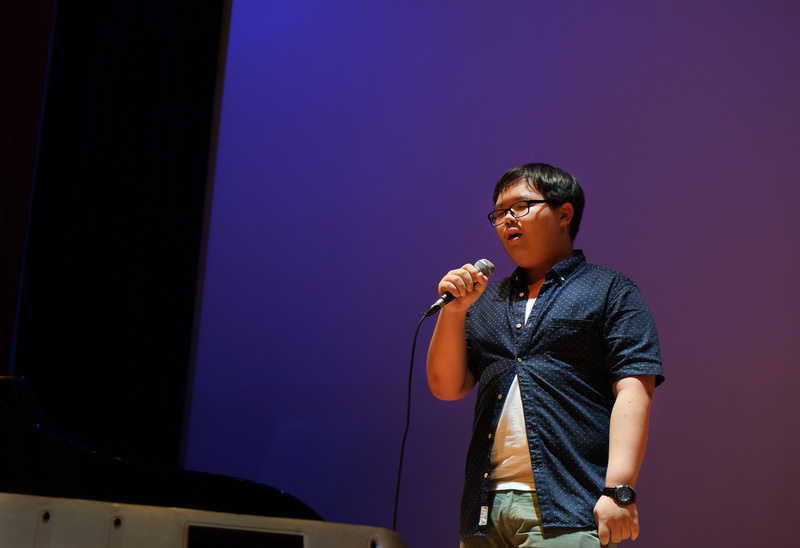 The five sentences were random and at a glance unconnected, including sentences like “I want to drink milk tea” and “I killed him!”, leaving audience members anticipant to see how the actors would weave them into the play. The actors skillfully made use of actions and facial expressions to drive the plot, with minimal reliance on lines. With wit and humour, the actors successfully weaved in the 5 sentences such that they flowed effortlessly with the plot, drawing loud chuckles from the audience every time a sentence was mentioned. One of the five actors, Yin YiRan (16S06S), candidly shared that “五句话 is definitely not something for the faint-hearted”, given the “high pressure” on the actors! She noted that “something so impromptu as 五句话 is really a test on the actors’ teamwork, creativity, and ability to think fast”, and that she “enjoyed it a lot even though it was very challenging”. Tension between father and son. Following that was the last play of the night, entitled “红芝麻”, or “Bloody Sesame” in English. It explored the tension between pursuing wanton materialism and interpersonal relationship satisfaction from the perspective of a teenage schoolboy. Influenced by his peers, he developed an intense yearning for the latest iPhone model, which his family was regrettably unable to afford. His doting father, not wishing to let his son down, toiled day and night to earn sufficient money for the iPhone — but eventually, died from overexertion. Unfortunately, the writer of this article felt that her proficiency in Chinese (or rather, the lack of it) significantly impeded her ability to fully comprehend the goings-on of the play, which was a true pity as many audience members seemed extremely tickled by it, roaring with laughter at the many humorous parts. Audience member Li Jia Xin (16S07D) reflected that the most memorable part of the play to her was when the schoolboy realised that “the most important thing in life is not to prove yourself to other people, nor to fulfill your material desires, but rather to appreciate what you have, and live your own life well”, as it was a moment that “deeply inspired and touched” her. Another audience member, who wished to remain anonymous, commented that the play should have a “more Singaporean context, as its China-based context resulted in some audience members not understanding the jokes told”. Post-production, CLDCS’ Chairperson Jia Zhuo Jian (15S06H) reflected that he was “very proud of CLDCS’ members”. He shared that although “most of the J1 members did not have past experience of stage performance”, they still managed to put up a “really remarkable job”. Overall, CLDCS put up a commendable production, which captivated and enthralled the audience with the various art forms put up. Raffles Press would like to commend CLDCS for a production well-done, and wishes them all the best for their upcoming endeavours!